A survey of exports of Red Danish cattle up to 1964 (Neimann-Sørensen and Ipsen, 1967) shows that most of these animals were exported to eastern European countries, and as a result there are now rather large populations of Red Danish cattle in some of them. Their performance is fairly well described in studies by Dymnicki (1974) in Poland, Loukotoval (1973) in Czechoslovakia and Vankov (1973) in Bulgaria. Genotype-environment interaction between herds in Denmark and eastern Europe is covered by Petersen (1975). Red Danish cattle have also been exported to several tropical countries, but in most cases little is known about their performance. This is due to lack of adequate production records, and to poor contact between Denmark and the purchasing country after export. In Thailand and India, however, exports were integrated into development programmes for milk production, and as a result reliable records are readily available. It has thus been possible to analyse the performance of purebred and crossbred Red Danish cattle under tropical conditions. Ove Madsen is from the Institute of Animal Science, Royal Veterinary and Agricultural University, Copenhagen, Denmark. His present address is Animal Production Department, Training Institute, ARTI, P.O. Box 400, Mbeya, Tanzania. A detailed discussion of the crossbreeding programme in Thailand was given by Madsen and Vinther (1975). The programme was undertaken at the Thai-Danish dairy farm, which is situated 15° north of the equator and 230 m above sea level. The climate is tropical, with daily temperatures ranging from 19°C in the cool season to 38°C in the hot season, and with relative humidities of 65 and 95 percent in the dry and rainy seasons respectively. When the project was initiated in 1962 no fixed breeding policy had been agreed upon. In the initial phase upgrading to Red Danish cattle was practised, but because of high mortality and disease incidence among purebred and grade cattle, back-crossing to the Sahiwal and Red Sindhi was adopted in the later stages. The foundation stock consisted of native cattle, improved native cattle (mainly white zebu from Burma), Indian milch breeds (Sahiwal and Red Sindhi) and Red Danish cattle. Data were analysed using the least squares technique, thus correcting for environmental effects. Details of the method of analysis and of feeding and management practices have been provided by Madsen and Vinther (1975). Table 1 shows that mortality was highest among purebred and high-grade Red Danish cattle, followed by Indian milch breeds. It was very low in the F1 generation, presumably because of heterosis effects. Mortalities were roughly the same among the crossbred groups having 37.5, 62.5 and 75 percent genes from Red Danish cattle. On the basis of the results, it was concluded that the optimum proportion of genes from Red Danish cattle for the environmental conditions prevailing in this experiment could be up to 75 percent but not more. As shown in Table 2, the age at first calving was high in the Indian milch breeds, whereas only minor differences were found between the other breeding groups. The calving intervals followed the same pattern as the figures for mortality, being very high for purebred Red Danish cattle, rather high for the Indian milch breeds, low in the F1 generation, and with only minor differences among the other crossbred groups. The milk and butterfat yields in the first and second lactations increased almost linearly with increasing proportion of genes from Red Danish cattle. It was therefore concluded that the proportion of genes from Red Danish cattle should be as high as possible, but within the limits set by mortality and disease, i.e. about 60 to 80 percent. First lactation yields were much higher for Red Danish cows imported from Denmark than for those born in Thailand. In the second lactations, however, the yields of imported animals were lower than those for animals born in Thailand. These results will be discussed later. The Indo-Danish project is situated 30 km from Bangalore, 13° north of the equator and 880 m above sea level. The climate is tropical monsoon, with daily temperatures ranging from 10°C in the cool season to 38°C in the hot season, and with relative humidities of 63 and 86 percent in the dry and rainy seasons respectively. A total of 18 bulls and 223 pregnant heifers were imported. These animals were used for purebreeding at the project farm. Male progeny were sold for breeding purposes to private farmers, but it has not been possible to trace the progeny of these bulls to any great extent. Nevertheless, it was possible to evaluate the performance of female crossbreds within the confines of the extension area of the Indo-Danish project. These results will be discussed in the following section. Feeding and management at the Indo-Danish project were practised according to Danish standards as far as possible. The data were analysed using the least squares technique, thus correcting for environmental effects. The cows of the Red Danish breed were classified into three groups: cows imported from Denmark, cows born in India out of sires from Denmark (i.e. first-born calves from imported heifers), and cows born in India out of Indianbred Red Danish sires. Table 3 shows the milk yields, butterfat yields and calving intervals for these three groups of cows. SOURCE: Madsen and Vinther, 1975. The difference of 326 kg milk and 11 kg butterfat between cows imported from Denmark and those born in India out of sires from Denmark is partly genetic and partly environmental. Genetic differences are expected because the imported animals were a selected sample of the population from Denmark, whereas very little selection was done among the calves born in India. Environmental differences may be caused by differences in feeding, management and/ or climate during rearing. The difference of 275 kg milk and 15 kg butterfat between cows born in India by sires from Denmark and those by Indian-born sires is a measure of the difference between the two sire populations. It is presumably caused by sires from Denmark being selected on the basis of progency tests, whereas sires from India were selected on the basis of pedigrees only. 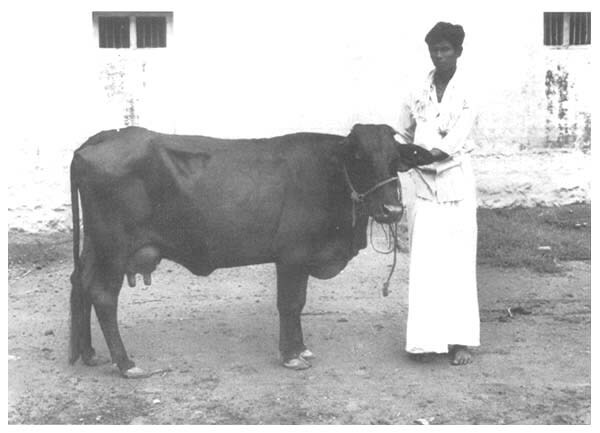 Milk recording began in villages in the Bangalore area in 1967 with the recording of 24 cows. In 1974 a total of 772 cows were milk recorded. Along with the milk recording scheme, an advisory scheme on feeding was operated. Thus cows were fed according to production. During the rainy season many farmers fed green fodder, while during the dry season most farmers fed only straw and concentrates. Pedigree information was available for some of the cows in the milk recording scheme, making it possible to classify them into breeding groups: Red Sindhi, Red Danish×Red Sindhi. Red Danish × improved local cattle, and Red Danish × Hallikar. However, for most of the cows there was no pedigree information. Since most of them were crossbreds between European and local cattle, they were classified as improved local cattle. Data for all these groups were analysed using the least squares technique, thus correcting for environmental effects. Table 4 shows the 305-day yields of milk and butterfat and the length of calving intervals. 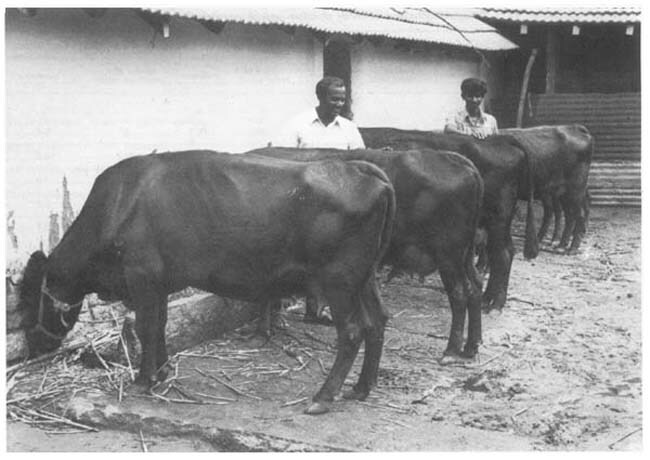 The number of observations for the Red Sindhi is small, but the results coincide with those of previous investigations in that the milk and butterfat yields are low and the calving interval is long (Mahadevan, 1966). It is assumed that the average proportion of Bos taurus genes in the group of improved local cattle was around 50. Few of these cattle were first crosses; thus heterosis effects are probably not important. The production records of this breeding group may therefore be considered as an estimator of the performance of cows which have approximately 50 percent Bos taurus genes but are unbiased by heterosis effects. By contrast, the Red Danish × Hallikar and Red Danish × Red Sindhi breeding groups are expected to have their full heterosis effects. Assuming that the producing ability of purebred Red Danish cattle under village conditions is the same as at the Indo-Danish project, the estimated heterosis effects for the F1 generation (Red Danish × Red Sindhi) are 16 percent for yield of milk, 30 percent for yield of butterfat and 16 percent for calving interval. Thus crosses between Red Danish and Red Sindhi have performed better than might have been expected had there been no heterosis. This was also observed in crosses between these two breeds in Thailand. These results indicate that there may be a large specific combining ability between them on crossing. A comparison of Red Danish × improved local cattle with improved local cattle shows that crossing with Red Danish cattle increased milk yield by some 457 kg and butterfat yield by 17 kg, whereas the calving interval remained virtually unchanged. On the assumption that improved local cattle have 50 percent Bos taurus genes, this difference would be a measure of the effect of increasing the proportion of these genes from 50 to 75 percent. In the Thailand data there was a decline in production from first to second lactation among imported heifers. The Indian data showed different results, but the increase in yield from first to subsequent lactations was much smaller than that normally observed in temperate countries. 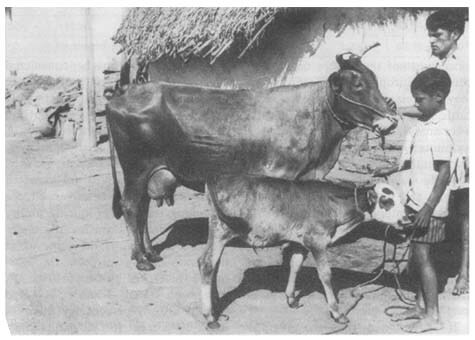 In India maximum production occurred in the second lactation, when correction for environmental factors was made. However, the investigations coincided in regard to the decline in yield from the imported generation to the generations born in a tropical country. As noted earlier, the reasons for this are probably both genetic and environmental. It is not possible to specify how much of the difference is genetic and how much environmental, but it appears that first lactation performance was a biased estimator of the production performance of purebred Red Danish cattle in subsequent generations. It may be useful to consider environmental conditions in tropical countries as consisting of climate on the one hand and level of feeding and management on the other. In both Thailand and India feeding and management were at a high level and nearly up to normal Danish standards. However, the climate in Thailand was unfavourable, whereas that in India was not severe. Climate and feeding factors are summarized in Table 5 and compared with those of Denmark. The scoring in the table does not imply that the difference between the climate of Thailand and India is as large as that between India and Denmark; it is made for ease of reference only. The production levels attained by purebred cattle in India are lower than those normally obtained in Denmark, while those of Thailand were even lower than those of India. This pattern follows the scores for climate and feeding management shown in Table 5. In both Thailand and India milk and butterfat production was higher for purebred and high-grade Red Danish cattle than for intermediate crossbreds. Similar results were obtained in the United States by crossbreeding the Holstein, Jersey and Brown Swiss with the Brahman and Red Sindhi (Branton, 1966). But previous experience from tropical countries suggests that intermediate crossbreds had higher yields than high-grade animals (Rendel, 1972). The most plausible explanation for this apparent discrepancy is that feeding/management was at a higher level in the Thailand, India and United States experiments than in those reviewed by Rendel (1972). If this interpretation is correct, feeding and management exert a greater influence on the productive performance of different genotypes than climate. This hypothesis is supported by the favourable performance of purebred cattle in Israel (Volcani, 1973). It is further supported by the fact that the season of calving had little influence on levels of production in Thailand and India. If climate had had a major influence on production, yields would have been low for cows calving in the hot humid season. However, the reproductive performance of purebreds and high grades has not been satisfactory in either Thailand or India. The calving intervals were long, and in Thailand the percentage of abortions and mortality was also high. On the basis of the interpretations presented here, it would appear that delayed breeding is a reaction of the cow to relatively high production in an unfavourable climate. A similar phenomen is known to exist in temperate climates: cows are difficult to get in calf immediately after calving, when production is so high that the cow is in negative energy balance. Milk and butterfat yields have increased almost linearly with the increase in the percentage of genes from Red Danish cattle. This is contrary to several previous experiments with other European breeds, where intermediate crossbreds have had higher production than high grades and purebreds. This apparent discrepancy may be due to the high level of feeding and management in the present experiments. However, mortality was high among high-grade and purebred Red Danish cattle under unfavourable climatic conditions in Thailand, and reproductive performance was not satisfactory in either Thailand or India. Yields of imported animals were higher than those of animals born in the tropics. The reasons for this are probably both genetic (little selection in the tropics) and environmental (sub-optimal feeding/management and climate during rearing). Branton, C., Mc Dowell, R.E. & Brown, M.A. 1966. Zebu-European crossbreeding as a basis of dairy cattle improvement in the U.S.A. Baton Rouge, Louisiana Agricultural Experiment Station. Southern Cooperative Series Bulletin No. 114. Madsen, O. & Vinther, K. 1975. Performance of purebred and crossbred dairy cattle in Thailand. Anim. Prod., 21: 209–216. Mahadevan, P. 1966. Breeding for milk production in tropical cattle. Farnham Royal, Bucks., Commonwealth Agricultural Bureaux. 150 p. Commonwealth Bureau of Animal Breeding and Genetics. Technical Communication No. 17. Neimann-sørensen, A. & Ipsen. E.J. 1967. Danish cattle at home and abroad. Vanløse, Technical Dairy Publishing House. 83 p.
Petersen, P.H. 1975. Genotype-environment interaction in milk production under Danish and Bulgarian-Czechoslovakian conditions. Anim. Prod., 21: 101–108. Rendel, J. 1972. Dairy cattle in hot climates. Wld Rev. Anim. Prod., 8: 16–24. Volcani, R. 1973. High milk production under unfavourable natural conditions. Wld Anim. Rev. (FAO), (8): 28–33.